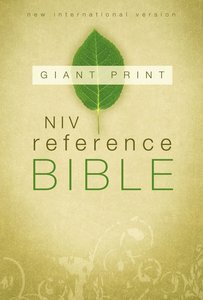 About "NIV Giant Print Reference Bible (Red Letter Edition)"
A winning combination of readability and references. Reading God's Word is more enjoyable than ever with this Bible's generous 14-point type. Easy on your eyes with an end-of-paragraph reference system, full-color maps, and a dictionary/concordance, the NIV Giant Print Reference Bible strengthens your study time and brings the Word of God into focus. Size: 17 x 24.1 cm. 4.3 cm thick.